I recently picked up a package of the Valentine’s Day-themed Chocolate-Covered Strawberry Oreos to try and found that the cookies exceeded my expectations. One of the things that made the cookies work so well is that the combination of chocolate and strawberry is a winner in any format you find it and the filling had a pronounced berry that contrasted nicely with the bittersweet chocolate wafers. 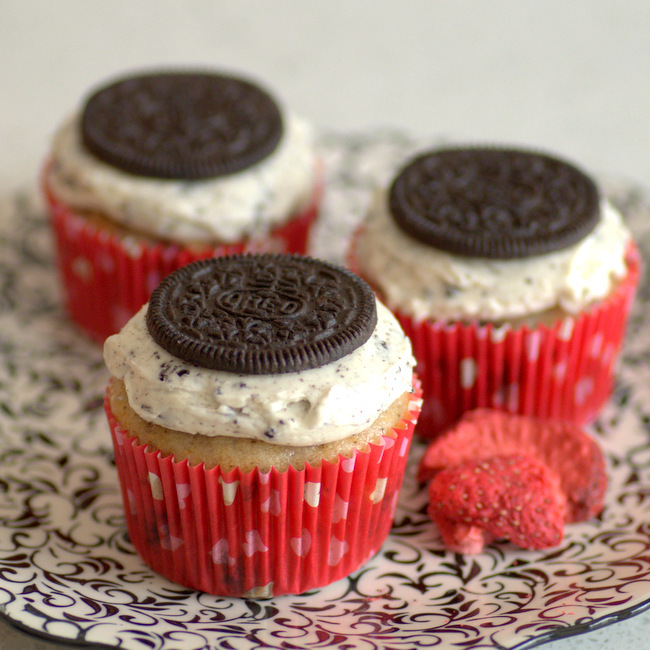 You and some hungry friends could easily much through a box of Oreos if armed with a sufficient supply of milk, but I think it’s more fun to transform them into cookies n’ cream baked goods, so I baked my leftover cookies into a batch of Chocolate-Covered Strawberry Oreo Cupcakes. 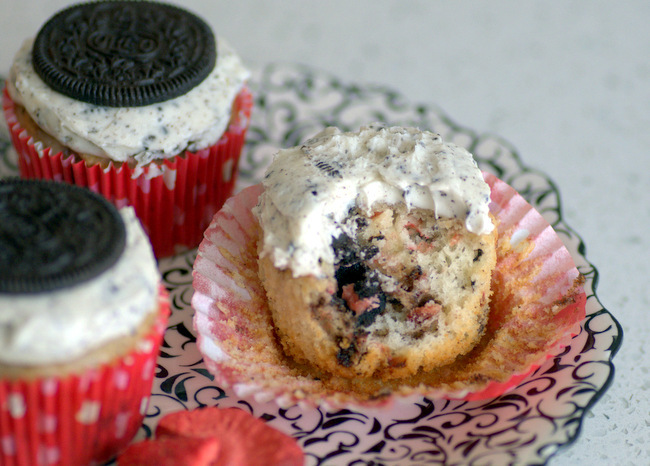 The vanilla cupcakes are packed with crushed strawberry Oreos, so you get berry flavor and cookies n’ cream in every bite. 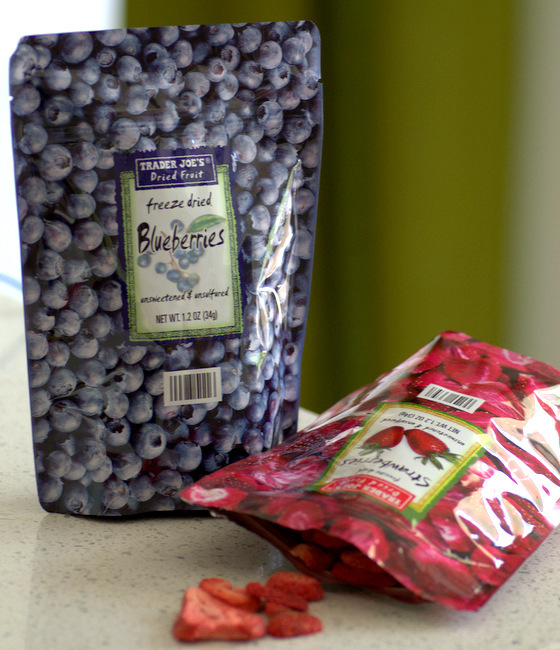 To enhance the strawberry flavor, I also added some freeze dried strawberries to the mix, though you can omit those if you don’t have them on hand. The baked cupcakes are topped with a cookies n’ cream buttercream made by stirring crushed chocolate wafers into buttery frosting. I experimented a bit with crushing the whole cookies for the frosting, but found that the filling wasn’t quite as tasty when mixed into the buttercream. A plain vanilla or chocolate frosting would make a nice topping, as well. The cupcakes bake up to be tender, but a little bit denser than other cupcakes. This is for two reasons. The first reason is that the batter needs to support the weight of all the chopped cookies folded into it. The second is that they don’t have quite as much sugar as some other cupcake recipes. Sugar always serves to tenderize and lighten a cake batter. In this recipe, however, the batter doesn’t need to be quite as sweet because quite a bit of sugary cookie creme is going into it and the whole cupcake would be a bit too sweet if there were any more sugar in the mix. In a large bowl, cream together butter and sugar until light and fluffy. Beat in egg whites, followed by vanilla extract. Stir in half of the flour mixture, followed by the milk. Stir in remaining flour mixture and mix until no streaks of dry ingredients remain. Fold in chopped cookies and freeze dried strawberries. Divide batter into prepared muffin tin. Bake for 16-18 minutes, or until a toothpick inserted into the center comes out clean. Allow cupcakes to cool completely on a wire rack before frosting. In a medium bowl, prepare 2 Ingredient Buttercream. Fold in crushed Oreo wafers and transfer mixture to a piping bag. Frost cooled cupcakes.